We are pleased to announce that our first event sold out! A second dinner will be held on Saturday, January 19, 2019. Make your reservations HERE. Bring your appetites on Saturday, January 19, for the Taste of India Dinner at Aerie Restaurant & Lounge. 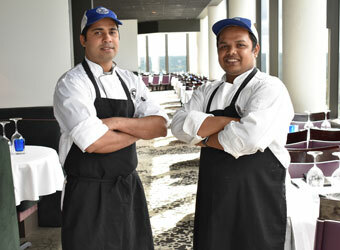 Chefs Mangesh Hegde and Yeshwant Reddy will present a special, one night only menu featuring dishes like chicken tikka, dal fry, and tandoori salmon. The special menu is available on Saturday, January 19, at $35 per guest plus tax and gratuity. Featured beverages will also be available. All ages are welcome. Call Aerie Restaurant & Lounge at 231-534-6800 for reservations or click here. Want to make a night of it? Call 231-534-6000 for great room rates. All entrees served with jeera rice and roti.